TNTP is out with a good report on why the teaching profession's antiquated step and ladder pay system doesn't cut it any more. They identify a number of problems that are accurate, and that need to change, but I want to explicitly add something to the conversation. Many of the solutions that TNTP suggests I think will make a difference, and they get at this idea, but I think many of their proposals won't fully address the underlying structural issue as to why teachers don't earn more: If we want to pay teachers more, we need fewer of them. If we think about the supply/demand economics of the labor pool of teachers, we have far too great a supply than there is demand. If you remember from economics class, quantity demanded is your x-axis and your y axis is price, or wage paid. At some point, there's this "ideal" equilibrium out there...in this case, 100 for demand, paid at .50 pence each (sorry, best graphic I found was British). When the supply offered increases, it depresses the price, or in the case of teachers, wage paid. I imagine you'd see something similar in Tennessee for elementary teachers. I think much of the same would apply to Tennessee. For those with Finland fever...the people that like to say places like Finland and Germany have the secret sauce when it comes to education, how they treat teachers, why they pay them more, value them better as a profession, etc. 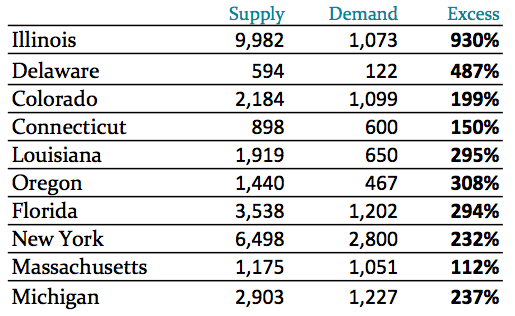 Ever looked at their teacher labor pool demand/supply market? They have very rigorous entrance standards for teacher training colleges. Only the top high school graduates get in to teacher training colleges and the programs are rigorous. This serves to keep a check on their labor supply of teachers. Here in America, to get into a teacher training college, you basically need to be able to spell your name, have a low GPA, and a low ACT or SAT score (that's a simplistic generalization and not all teacher training colleges are like this). If we want to pay teachers more, school districts and political leaders will need to challenge higher education institutions and the higher education political lobby to modify their teacher training college business model, which for many higher ed institutions, is lucrative. It's high time in American public education this happen, because 1. our students need better teachers, and 2. teachers deserve to be paid more for the incredibly hard work they put into their profession each day. So if we want to do something, really do something about how much teachers make, we need to do something about the teacher labor pool supply/demand economics.